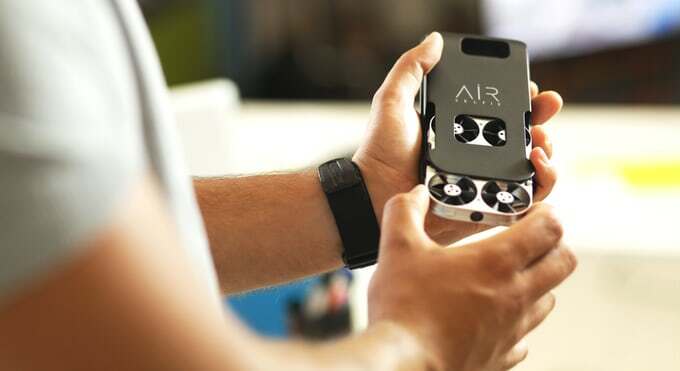 AirSelfie is a flying camera that is small enough to fit inside of your smartphone case. As you may have guessed the AirSelfie is meant for taking selfies, without the hassle of having to hold up a selfie stick till your arm hurts. 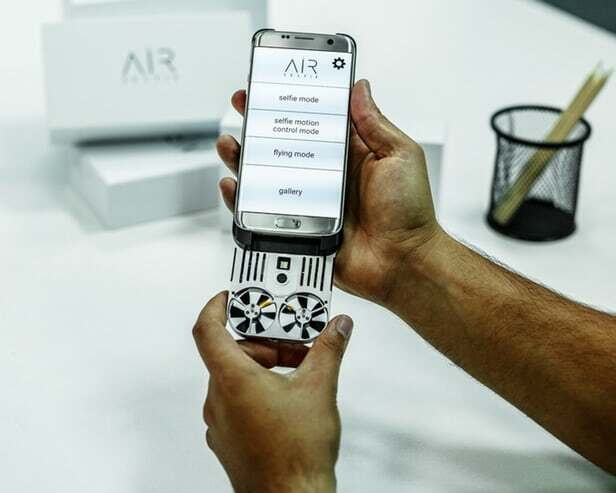 The AirSelfie drone connects to iOS or Android phones via Wi-Fi and can be controlled using a companion App. Using the App, the user can control the drone through three different flight functions: selfie mode, selfie motion control mode and fly mode. Selfie mode is the simplest to control featuring just two directional buttons to make the drone move farther or closer to the user. Selfie motion control mode allows the user to control it in real time via a virtual joystick in the App. Flying mode is used when the user wants to use their phone horizontally and mimics more of a classic drone controller. The drone can stay in the air for three minutes at a time and can fly up to 66 feet away and reach 66 feet in altitude. The best part may be that you can carry the small drone with you at all times. 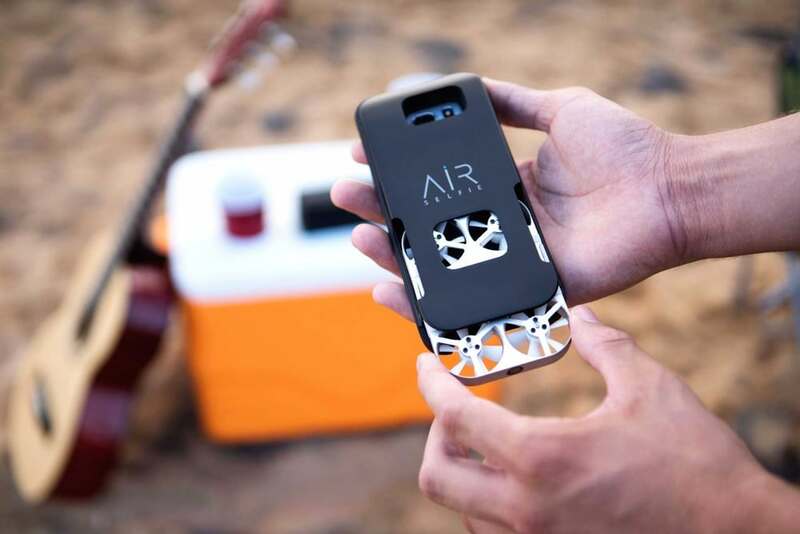 The AirSelfie’s aluminium-based shell casing measures 3.72 x 2.65 x 0.42 in and weighs 52 grams, making it lightweight enough while still offering protection from outside elements. The drone comes with its own phone case which also charges the drone in just about 30 minutes, although there is the option to charge it directly with a cable. As far as quality goes, the AirSelfie is equipped with a 5-megapixel camera and has its own built-in 4 GB SD card. The user’s captures are automatically downloaded to the smartphone app and can be easily shared on social media. 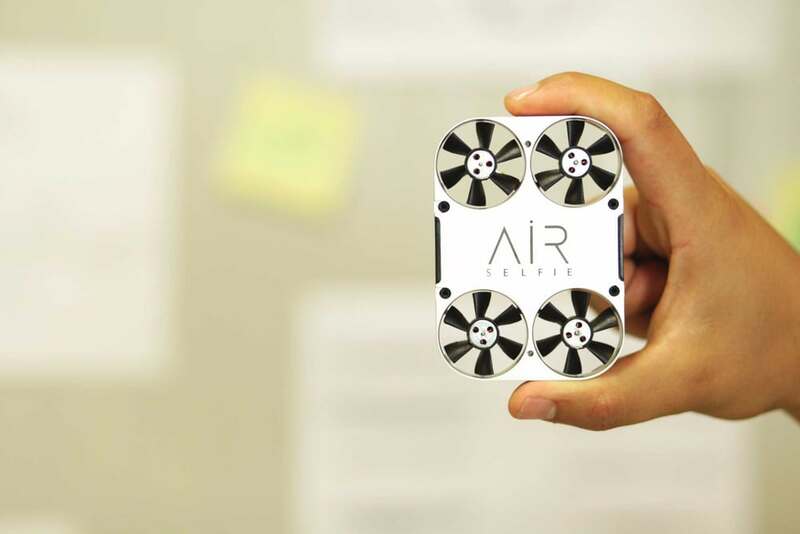 The AirSelfie is currently part of a Kickstarter campaign, having well surpassed its goal of $47,687. Early pledges of about $192 are still available and will give you the one AirSelfie, one phone cover and one micro USB cable.